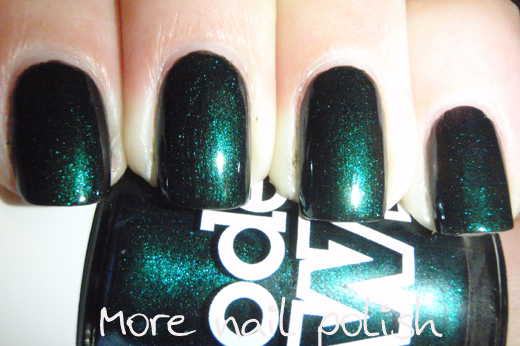 Emerald Black from the Models Own Beetlejuice collection is very black. So black that almost every photo I took of it, it just looked plain black. 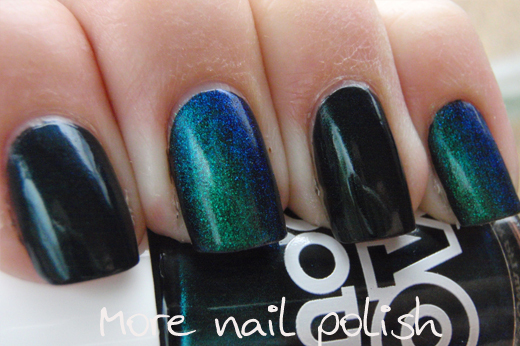 But it does have a green shimmer and also hiding beneath the depths of the black is actually a violet blue colour shift. Unfortunately, it's really difficult to see the blue shift very well on the nail, and even hard to capture it on camera. But I think I managed to sneak a bit of it in, in the second photo. At this acute angle, with lighting from behind, you can see the blue, you can also see how blue it is in the bottle at this angle too. This shot is with artificial light, and probably shows what it looks like most of the time. And with the LED macro light. 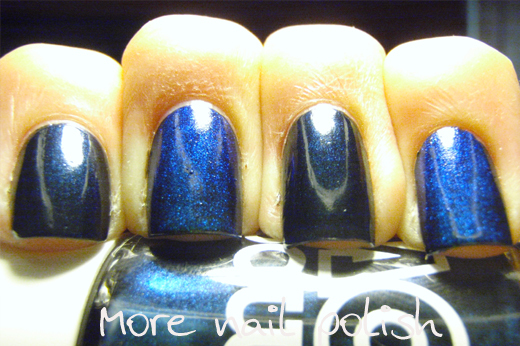 The only polish I have that shifts from green to blue is my colour morphing top coat. So I put a layer over black on the index and pinky fingers to compare the difference. As you can see, the blue shift is identical and below, the green base is identical too. 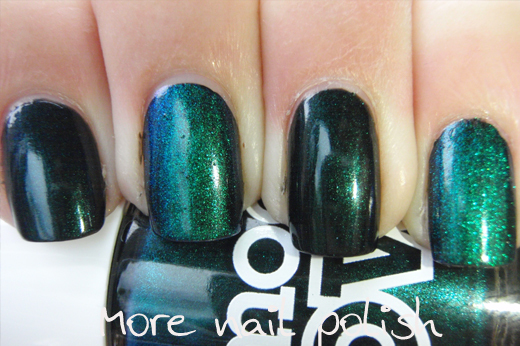 The only difference is that the Models Own polish is a very pigmented black, which means you lose most of the shimmer. 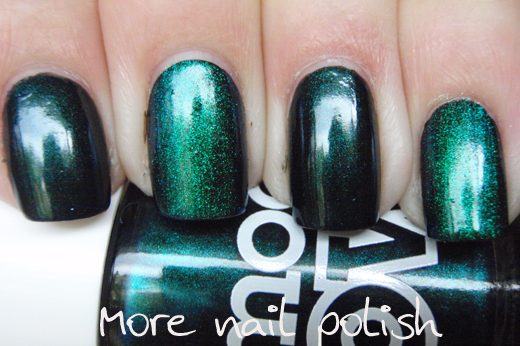 I love it idea of this polish, but for me it's just a bit too richly pigmented with black, resulting in the loss of much of the duochrome shift. Very nice! My two favourite colors in one polish! 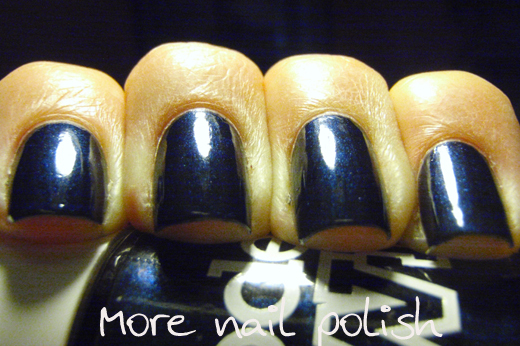 Great shots of what looks to be a tricky polish. Beautiful shots and a beautiful polish. I totally agree - they've put too much black in! Your photos are gorgeous, especially the second one which you definitely captured the blue! 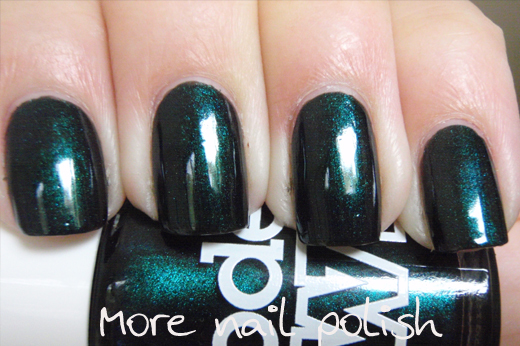 The top coat is amazing!!!! Do you mind if I ask how much of the colour morphing pigment you added to your base? No doubt this would be another you would be able to duplicate with your tints and colour morphing powder. Fascinating seeing your experiments and comparisons. Shame you can't see the colour shift more, but it's still gorgeous!